We offer an extensive range of highly visible security, promotional and charity wristbands to cover all your event needs. 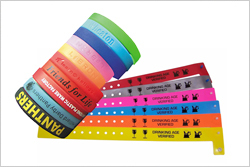 Including Silicone Wristbands, Tyvek Wristbands, Vinyl wristbands, plastic wristbands and specially RFID wristbands. Wristbands manufactured from Silicon are an ideal way to promote your Company or Campaign. Wristbands including Single Color Silicone Wristbands, Multi Color Silicone Wristbands, Embossed and Debossed Silicone Wristbands and popular Color Filled Silicone Wristbands. Silicone wristbands are sometimes called cause wristbands or rubber wristbands. Wide Face Vinyl wristbands are made with the same strong tear and stretch resistant material as our other vinyl wristbands but offer a larger print area for more space and increased visual impact. Accory's Straight Vinyl wristbands are strong, waterproof and long lasting perfect for multi-day use and rugged environments. The Tyvek Wristbands is an affordable, durable, and secure wristband, ideal for controlling access for concerts, festivals, nightclubs and sporting events etc. Made from DuPont™ Tyvek, the best high-density polyethylene fiber in the world. Reusable Plastic Wristbands are the ideal band to use where security is not an issue and where you want to use the bands more than once. They are strong, durable and are suitable for both wet and dry conditions. Our Glitter wristbands add sparkle to your event. If you're looking for a glitter -like design with a metallic look, holographic wristbands are the ideal solution. Holographic wristbands are commonly used at higher-priced events or for VIP guests. The RFID Wristbands is the cornerstone of efficient and secure access control and payment for events, amusement parks, hotels as well as bars and clubs. They content a RFID tag inside to reliably store and transfer data.